5-Valve Manifolds Overview | Texas Valves & Instruments, LLC. 3/8" minimum bore diameter to help ameliorate spiking signals caused by pulsations in the pipeline. Very tight reliable seats and seals to prevent errant measurements cause by small leaks. These seats and seals should be able to stand up to repeated use caused by the calibration verification process. Integrated blocking valves to minimize the potential leaks between the tap valves and the equalization valves. 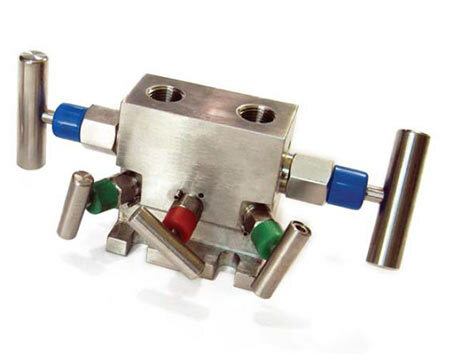 These valves can also serve as double equalizing valves to help insure against measurement error. Angle pattern equalizer and vent valves to make calibration more convenient especially with gloves.